This outdoor classroom is very straightforward in its design – it is a classroom that is actually located outdoors. In place of a cement floor, there will be grass; instead of desks there will be stone blocks; instead of a ceiling there will be a tree canopy; instead of recirculated conditioned air there will be the natural breeze; and instead of a typical square classroom there will be an open, dynamic area where students and teachers may come to break away from the stresses of the school building, relax, and learn in a new and stimulating environment that’s ever changing. There are many different design possibilities for an outdoor classroom. Some designs may feature very minimal and basic materials, while other designs may be very intricate and include many materials and features. 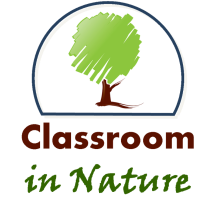 For example, a minimal outdoor classroom could consist of simple wooden benches, on which students may sit and all face the same direction – toward the instructor. These benches could be located in a mowed field, or under some trees in a school yard. This type of outdoor classroom design would have a very minimal cost – possibly just a hundred dollars for a few benches. A mid-cost project may consist of stone seating, or perhaps a curved wall of stones for seating, where students may sit one next to the other and listen to the instructor, perhaps in a mulched area or surrounding an old-growth tree. On the other hand, a high-cost outdoor classroom project may consist of multiple rows of stone seating, flower gardens, a nature trail, interpretive signs, among other things within a wooded setting, for example. A project of this caliber may cost many tens-of-thousands of dollars or more. The aim of teachers, administrators, and program designers should be to create effective informal learning environments to help support the teaching process. To do this, the informal environment, or outdoor classroom, should be designed with the following in mind: greenery, proximity to school building, and ease of access and use. To elaborate, the space should be very green, or natural, in terms of trees, shrubs, and grasses growing in the area, with a minimum amount of plastics incorporated with the design and constructed. This outdoor classroom should also be at a safe distance from the school, but also have some seclusion so it is not very obvious that there is an outdoor classroom when looking from the school building and vice versa. Next, the outdoor classroom needs to be accessible through a light walk over a paved, graveled, or mulched pathway. Finally, the outdoor classroom should be usable – in terms of maintenance being regularly performed along with style of set-up/seating.